I spend far more time than I care to think about doing laundry. Every day will see me washing at least TWO loads full of clothes. It's one of life's constants. We're a house of five so there's always something to wash. Especially when you have kids and their idea of cleaning is picking everything up off the floor and throwing it in the laundry. Being a SAHWM (stay at home working mother) I'm the 'lucky' gal who gets to deal with it, for wont of a better turn of phrase. Other phrases to describe this delightful household chore might also include: mindless occupation, boring job, necessary evil, pain in the arse, etc, etc. But I'd like to add one more to the list: quite possibly dangerous. Be still my beating-out-of-my-chest-heart and pass me the frikking Mortein. For the record, I HATE spiders. With an especially strong aversion to the ONES THAT ARE POISONOUS. The Provider happens to be, amongst many other things, a pest controller. As any tradies wife will tell you, your own home is the last place they tend to work as everyone else's paying job seems to get done first. However, I have firmly suggested that he find the time to spray our place or I shall not be responsible for the sudden HALT to the supply of freshly laundered clothes. What kind of creepy crawlies freak YOU out? And who deals with them at your place? Ew! 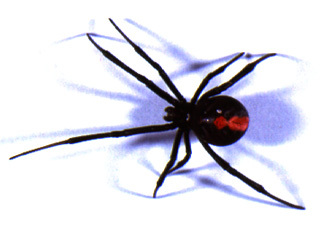 Horrible creatures.I hate spiders too, we get funnel webs here and they scare the heck out of me. Eek! Funnel webs are VERY scary. I think it's the blackness and their unbelievable size that freak me out - I am a complete wimp when it comes to them.